Considering a Career in Vascular Ultrasound? What Do Vascular Technologists Do? Vascular technologists assist physicians in the diagnosis and treatment of a wide variety of disorders affecting the vascular system (excluding the heart). A wide range of instrumentation is used to acquire and record information related to blood vessel anatomy and physiology. 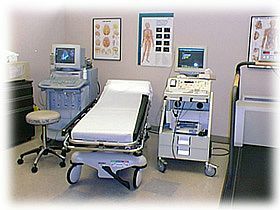 This lab in the Stanford Vascular laboratory includes both duplex ultrasound imager and a indirect Doppler ultrasound machine with a treadmill for physiological assessment. Ultrasound transmits high frequency sound waves into the body that reflect off the vessels of interest. It is non-ionizing with no known side effects to either the technologist performing the examination or the patient being examined. The reflected sound waves are processed to form high resolution, images of the blood vessels (B-mode imaging) and to measure the speed and direction of the blood (Doppler Ultrasound). Instruments with the capability of acquiring both B-mode imaging and Doppler information are referred to as duplex scanners. Vascular technologists also use instruments other than duplex scanners to measure parameters such as blood pressure, limb volume changes, and oxygen saturation. Anatomy: Segments of the vascular anatomy typically examined include the cerebral circulation (blood supply to the brain), peripheral circulation (blood supply to the upper and lower limbs), and the abdominal circulation (blood supply to the gut, the kidneys and liver). The specific segments examined are determined by the referring physician and the patients' clinical symptoms. Vascular technologists prepare patients for the examination by explaining the procedure; obtaining a pertinent clinical history through direct questioning and review of the patient's prior records; and performing a physical examination that usually involves observation of the patient, palpation of pulses, auscultation (e.g. listening with a stethoscope), and in some cases, measurement of blood pressures at various locations. The vascular technologist then performs the examination, and records. Once the data is compiled by the technologist, it is reviewed and interpreted by the physician and a final report dictated. Formal education is offered through associate and baccalaureate degrees in cardiovascular technology and diagnostic medical sonography. Applicants should investigate the educational institution to verify that upon graduation, they will be eligible to apply for the credentialing exams offered through the American Registry for Diagnostic Medical Sonography (ARDMS) and Cardiovascular Credentialing International (CCI). Please visit the ARDMS and CCI websites to find out more information on the examination. Graduates from programs that are accredited by the Commission of Allied Health Education Programs (CAAHEP) in vascular will automatically be eligible for the examinations. Visit the CAAHEP website to locate a program near you at www.caahep.org.